Trying to find the perfect honeymoon location? Look no further than Fiji. Fiji is the ultimate dream destination for the picture perfect vacation. The 333 islands that make up Fiji contain miles of pristine coastline just waiting to be explored. Fiji is known for its crystal-clear waters, welcoming culture and beaches that are so perfect they look airbrushed. Transport yourself to “Fiji time,” immerse yourself in the famous Fijian hospitality, and experience pure beauty on land and at sea – only then will you being to understand what makes Fiji so special. Fiji’s breathtaking views, welcoming atmosphere and outdoor adventures make it a top honeymoon destination. Tokoriki Island Resort is one of Esplanade’s favorite places to send recently-wed couples. This adult-only boutique resort offers the ultimate relaxing beach vacation, and the deal is sweetened with special honeymoon packages. Stay in one of the contemporary 36 bures or villas, all with a tropical outdoor shower under the stars. Spend the day relaxing on the beach or use complimentary services like paddleboards and kayaks. If you are looking to get off the beaten track for snorkeling, take advantage of Tokoriki’s snorkeling tours, equipped with a private guide. Capture your memories at the resort by booking a 1 hour photoshoot with a leading Fiji lifestyle photographer. Tokoriki’s relaxed and romantic style carries over into the many dining options offered. Sip a cocktail under a palm tree during the day and enjoy a romantic dinner under the stars at night. The menu is always changing and features South Pacific and Asian influences with a modern twist. Don’t miss Oishii Teppanyaki Restaurant, voted the #1 restaurant in the Mamanuca Islands, which only serves four couples at a time for an incredibly intimate fine dining experience. 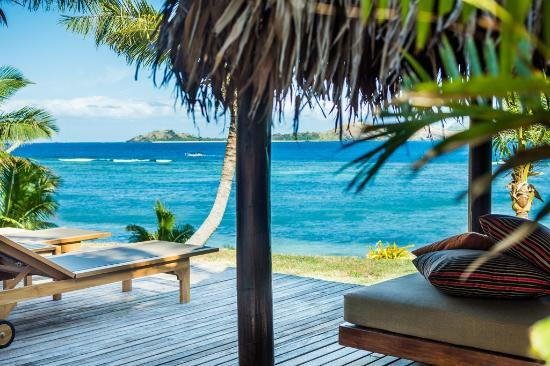 Surprise your spouse-to-be with the honeymoon of a lifetime in Fiji! Thank you to Tokoriki Resort for the photographs. Ksusha became a world traveler from a young age, traveling across Europe with her family. She brings a "can do" attitude to every trip she plans and works toward one ultimate goal: to help people create lifelong memories.